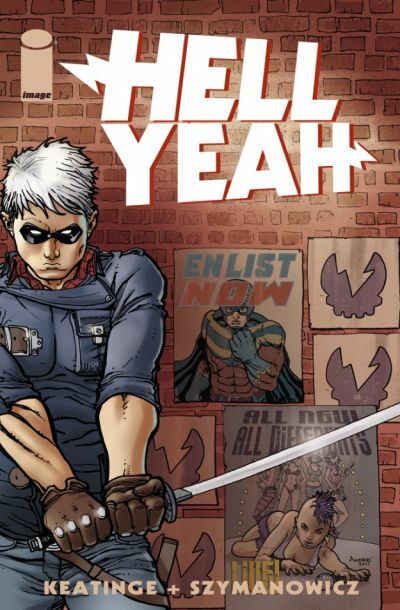 Berkeley, CA â€“ 6 January 2011 â€“ The future is now as Eisner and Harvey award-winner Joe Keatinge and ELEPHANTMEN’s Andre Szymanowicz debut the last generation of superheroes in the new ongoing series HELL YEAH. Twenty years ago, the world was rocked by the emergence of real-life superheroes. Sports and entertainment industries collapsed overnight as people who can run across the planet and punch through walls changed the world forever. A new global culture formed around these bigger-than-life beings and now the generation raised in its wake must fight to find a place in this brave new world! By pairing the energy and excitement of the original Image superheroes with modern, innovative storytelling, Keatinge and Szymanowicz have crafted a modern superhero epic that could only begin on Image’s 20th anniversary. HELL YEAH begins with Ben Day, a college student who finds out versions of himself are being murdered throughout the Multiverse. He must determine where his life diverged from his other selves and just why these crimes have taken the interest of even the world’s greatest super-celebrities. Keatinge and Szmanowicz build a sweeping world with a massive cast of characters, a world that threatens to destroy Ben’s very existence. HELL YEAH #1 (JAN120501), an 32-page full-color superhero comic book with no ads for $2.99, will be on sale in stores and digital platforms on March 7 and is available for order in the January issue of Previews. A preview of the first issue of HELL YEAH will be featured at the end of John Layman and Rob Guillory’s CHEW #23 on January 18th.